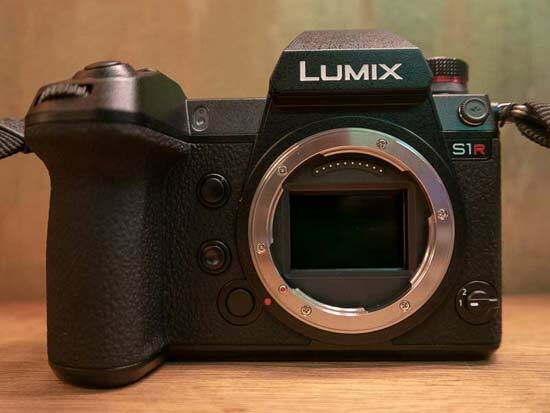 Panasonic have entered the full-frame mirrorless camera market with the launch of the flagship Lumix S1R. It has a 47.3 megapixel sensor with no low pass filter, an expanded ISO range of 80-51200, new Venus image processing engine, and the world's highest resolution electronic viewfinder. A standout feature is the High Resolution mode, which allows the Panasonic S1R to capture 187-megapixel equivalent photos by rapidly taking 8 separate images and combining them into one. Other key features include a 6-stop Dual Image Stabilizer (when used with compatible lenses), 6fps continuous shooting with full-time auto-focusing (9fps without), auto-focusing speed of 0.08 sec down to -6EV low-light, Eye AF mode and animal recognition driven by Artificial Intelligence Technology, and 4K video recording at up to 60/50p in 4:2:0 8-bit quality with a 1.09x crop of the full frame sensor. The weatherproof Panasonic S1R has a large status LCD on top of the camera for quickly checking the camera's key settings, the welcome inclusion of a thumb-controlled AF joystick on the rear, a 5.76-million-dot OLED electronic viewfinder with magnification that can be adjusted from 0.78x to 0.74x or 0.7x, a triaxial tilt 3.2-inch touchscreen LCD with 2.1-million-dot resolution, dual SD/XQD memory card slots, Bluetooth and wi-fi connectivity, and USB charging. 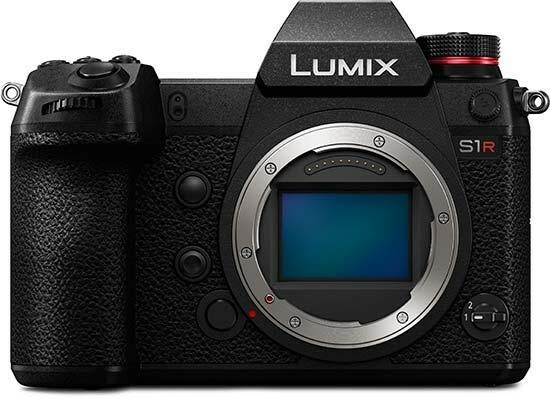 The Panasonic S1R is priced at £3,399.99 / $3,699.99 body only, or £4,199.99 / $4,599.99 with the Lumix S 24-105mm MACRO F4 O.I.S. kit lens. At first glance the new camera looks quite similar to the Panasonic G9 Micro Four Thirds model. The Lumix S1R is made out of a magnesium alloy, full die-cast chassis and is splash/dust-proof and freeze-proof down to -10 degrees Celsius. The tripod socket is in-line with the centre of the metal lens mount and the camera has an impressive shutter release life of 400,000 shots, double the life span of the G9. 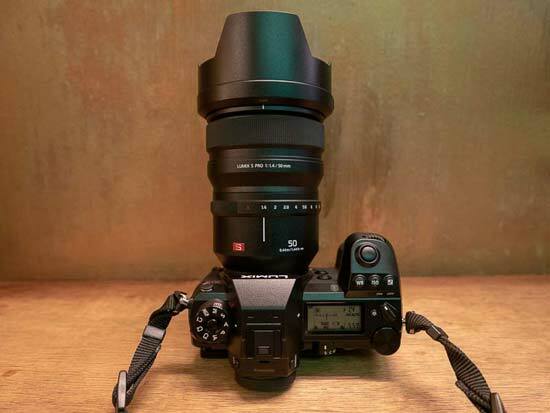 The Panasonic S1R ships either body only or with the Lumix S 24-105mm MACRO F4 O.I.S. kit lens. 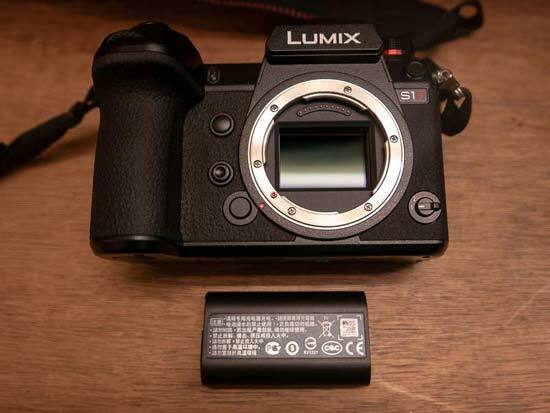 There's an optional new DMW-BGS1 battery grip, which houses an extra battery to extend the overall life and replicates all of the principal controls, also sharing the same splash / dustproof design as the S1R body. If you're going to use the S1R with a telephoto lens like the equally new Lumix S PRO 70-200mm f/4 O.I.S. zoom, we'd definitely recommend adding the DMW-BGS1 grip. 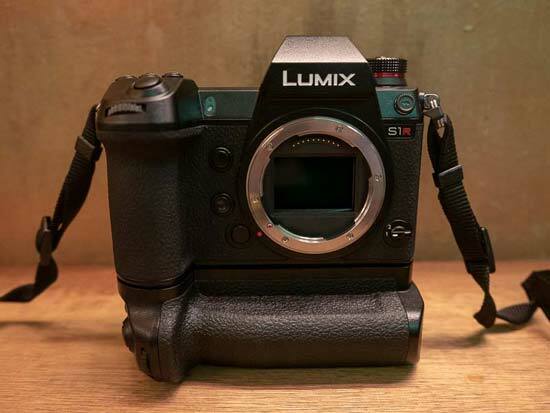 Panasonic have implemented a very impressive dual image stabilisation system on the S1R, which works in the same way as the GH5 and G9 cameras, combining 2-axis stabilisation from the lens (if available) with 5-axis stabilisation from the camera body. Without a stabilised lens attached, the S1R offers 5.5-stops of in-body image stabilisation, improving to 6-stops of Dual Image Stabilisation when a stabilised lens is mounted, the best of any full-frame mirrorless camera that we've tested. The in-body and dual image stabilisation system also both work for stills and video recording. Panasonic have also added a new I.S. Status Scope, which displays a graphic interpretation of the current vibration levels. The Panasonic S1R continues to use a 225-point Contrast AF system with their unique DFD technology, just like the G9, but it has a slower claimed speed of 0.08 seconds, compared to the G9's 0.04 seconds. This is still pretty fast, especially considering this is a full-frame mirrorless camera, but it's definitely one of the areas where the S1R loses out to some of its main rivals, especially those that employ a dual phase-detection and contrast-detection system. DFD technology calculates the direction and the amount to move the focus lens at a single movement by predicting it with 2 images that have different depth of field. In practice, the S1R's auto-focusing was fast and accurate in good lighting with the 24-105mm F4 lens, but a little slower and more hesitant in really low-light, although we found that it almost always locked onto the subject regardless of the delay. Depending upon the particular lens that you're using, though, there can be a noticeable lag as the camera focuses, especially with the Lumix S Pro 50mm F1.4 lens that we tried during testing. Autofocus does work in low light all the way down to -6 EV with the 50mm F1.4, comparable to the Canon EOS R and the RF 50mm F1.2 lens. There are a wide range of AF modes available - Face/Eye/Body/Animal detection, tracking, multiple-area AF with up to 225 focus areas, Zone (vertical/horizontal), Zone (Oval), 1-area AF with a selectable focus area, 1-Area, and Pinpoint. Within the Face/Eye/Body/Animal detection option, animal detection can be set to on or off. In this mode you can quickly and intuitively select between multiple faces or eyes on the fly using the rear joystick. In practice the S1R proved to be quick and tenacious at recognising and locking onto a subject's eye, although the way in which Panasonic show this in the viewfinder takes some getting used to, using a crosshair rather than a small rectangular box as with other rival systems, most notably Sony. The AF point can also be resized and positioned anywhere within the frame using the touchscreen LCD or a combination of the rear control dial and the rear scroll wheel. The Panasonic S1R's impressive High Resolution Mode combines 8 shots that are shifted by one pixel every time and then merged together into one super-resolution image, comprised of 187 megapixels, with the resulting RAW files being a whopping 333Mb and 16,736x11,168 pixels in size, which should prove a good test of your computer's processing capabilities! The camera ideally needs to be mounted on a tripod or other stable surface, rather than being hahnd-held, and it doesn't work very well if there's a moving subject in the frame, despite the addition of an option for reducing motion blur, but otherwise it's a great feature that will particularly please landscape photographers looking for the highest possible resolution. Note that the camera only records RAW images in the High Resolution Mode, although there is an option to then convert them to JPEGs in-camera. On the video side, the S1R can record 4K movies at 50/60fps, and there's also a 180fps full HD slow-motion mode. The main difference between the S1R and the S1 in terms of video is that the former can only record in 4:2:0 8-bit, whereas the latter will be able to record in 4:2:2 10-bit via a future, paid firmware update, which may or may not be a deal-breaker for the dedicated videographers out there. The S1 also additionally features full pixel readout at 30p, a wider variety of gamma curves, and extra panoramic aspect ratios, all of which are missing on the S1R. The S1R offers a Wi-Fi function that can take advantage of the faster 5GHz IEEE 802.11a/n/ac standard in addition to the conventional 2.4GHz (IEEE 802.11b/g/n). Establishing a wi-fi connection lets you use your smartphone to change the key camera settings and even fire the shutter button remotely, while the auto transfer function automatically backs up your photos onto a tablet. You can also use GPS data from your smartphone to record the shooting location onto your images. The Bluetooth Low Energy V4.2 connectivity option inherited from the G9 establishes a low-energy, permanent connection between the camera and a smart device for easier transfer of images. Located on the front of the Panasonic S1R is a tiny focus-assist and self-timer indicator lamp, lens release button, two customisable Function buttons, metal lens mount, flash sync socket and a very deep, rubberised hand-grip that's one of the nicest that we've ever used on any camera. 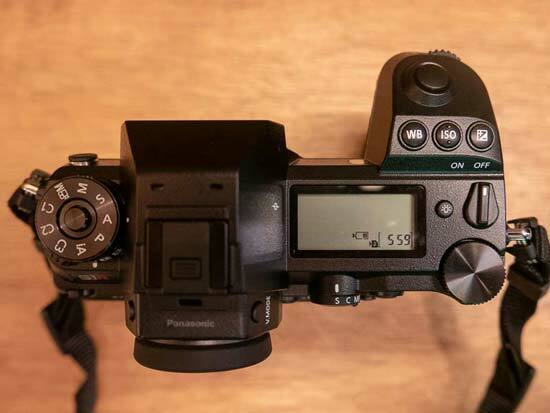 There's also a brand new Function switch in the bottom-right corner that by default toggles the camera to silent mode/electronic shutter, but as with most buttons that Panasonic add, it can be customised to one of a multitude of different options. The majority of the S1R's exterior is a textured black plastic, with the handgrip, front,, right-hand and left-hand corners finished in a tactile rubberised coating. On the top-left of the S1R is a lockable shooting mode dial, sitting on top of the burst mode//bracketing/self-timer/time-lapse dial. The Panasonic S1R has a good burst shooting mode which enables you to take 9 frames per second with the focus and exposure locked at the first frame, or more usefully 6 frames per second with full-time AF tracking, both for up to 50 JPEG images or 40 RAW files at the highest image quality. In comparison, the Sony A7R III offers 10fps burst shooting, much faster than the S1R. No blackouts occur in the LCD screen even during high-speed bursts, which means that you can continue to track your subject whilst shooting. There are three 6K Photo functions - 6K Burst Shooting, 6K Burst (Start/Stop) and 6K Pre-burst - which all record continuous 18 megapixel stills at a 30fps shooting rate. 6K Burst allows you to continuously record 18 megapixel images at 30fps, 6K Pre-Burst does the same but for one second prior to and one second after pressing the shutter button in order, giving you 60 frames to choose from, and 6K Burst (S/S) allows you to playback your video, pause at the chosen moment, and use the shutter button to mark a chosen frame from the video and save it as a single 18 megapixel frame. The S1R also offers the same option for 4K Photo, which doubles the capture speed to 60fps but lowers the effective resolution to 8 megapixels. The traditional shooting mode allows you to choose from the different exposure modes. The usual selection of Program, Aperture Priority, Shutter Priority, and Manual are available for the more experienced photographers. Additionally there are 3 custom modes, marked C1, C2 and C3, which allow you to configure your favourite settings and quickly access them, Intelligent Auto for less experienced users, and the Creative Movie mode which provides access to all of the camera's extensive range of video options. In the middle is an external flash hotshoe, with two buttons on either side - the LVF button for switching between the viewfinder and the rear LCS screen, and the new V.Mode button. This toggles the viewfinder magnification from 0.78x to 0.74x or 0.7x, allowing you to pick a magnification that's best suited to your particular eyesight. Located on the top-right of the camera is a large status LCD screen, much like you'd find on any prosumer DSLR camera, which usefully shows all of the key camera settings in a very clear way. Alongside the status LCD screen is a small button to illuminate it via a backlight, and next to that is the On/Off switch. It's not the most convenient position, but does at least offer the benefit of making it hard to accidentally turn the camera on or off. 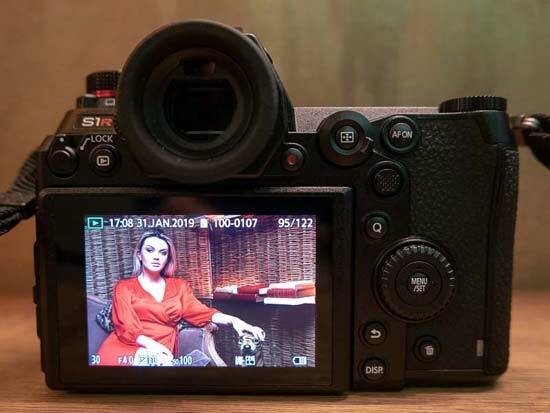 The Panasonic S1R starts-up and is ready to take a photo in less than a second, and it takes about 1/2 second to store a JPEG and RAW image, allowing you to keep shooting as they are being recorded onto the memory card, with no perceptible LCD blackout between each image. In front of these controls are three round buttons for setting the white balance, ISO speed and exposure compensation, which make it easy to access the camera's key exposure controls, and in front of those are the shutter release button and the front control dial set into the top-edge of the handgrip. Note that all all the major buttons on the S1R can be set to illuminate in the dark, a very handy feature for night shots. The Panasonic S1R employs both a traditional mechanical shutter and a completely silent electronic shutter, which as well as not spooking your subject ensures that it's completely sharp by avoiding any unwanted pixel shifting. The Delay Shutter option helps to remove the effect of hand-shake by releasing the shutter after a specified time (8, 4, 2 or 1 seconds), a feature that's also used for the new High Resolution shooting mode. Turning to the rear of the S1R, we find a large 3.2 inch OLED touchscreen with 100% scene coverage and 2.1-million-dot resolution. This triaxial monitor is hinged on the bottom of the camera and can be flipped out for low or high angled viewing in both portrait and landscape orientation. 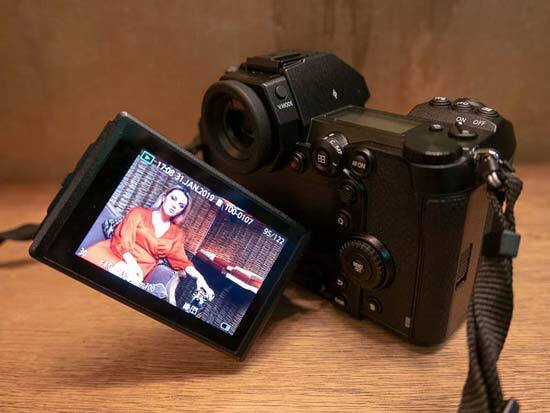 You can use the screen as a waist-level viewfinder, holding the camera overhead, in both vertical and horizontal positions, although it's not as versatile as the free-angle screen found on the Lumix G9. The Panasonic S1R inherits the G5's intuitive touchscreen interface. The most immediately noticeable function is the ability to use the 1-area AF mode to focus on your main subject simply by touching it on the LCD. If the subject then moves, the Panasonic S1R cleverly follows it around the screen using the the AF tracking function. If the subject exits the frame entirely, simply recompose and tap it again to start focusing. Impressive stuff that makes focusing on off-center subjects fast and intuitive. There's also a clever feature called Touchpad AF allows you to move the focus point area with your finger on the LCD while you're looking through the EVF, something that's been "adopted" by other manufacturers. It is a little too easy to accidentally press the screen and set the focus point to the wrong area for the current subject, but a simple tap in the middle of the LCD will center the AF point (or you can turn this feature off altogether). The size of the AF point itself can also be changed simply by pinching on the touchscreen, just like on a smartphone. If you prefer to manually focus, you can magnify any part of the subject from 3x up to 20x by simply dragging the yellow box around the screen and pinching in/out. The final touchscreen ability from an image composition point of view is the ability to release the shutter, with a small icon on the right hand screen enabling this functionality, and then a single on-screen tap all that's required to take the picture. All of the menu options can be changed via the touchscreen interface, including the Main menu system. You can also control image playback by touching the screen, with the ability to tap a thumbnail to see the full-size version, scroll through your images by dragging them from side to side, and magnifying them up to 16x. The clever Post Focus mode allows you to take a series of photos all with a different focus point, and then choose your preferred one after you've captured the shot. This can be more useful for some subjects than others, for example macro shots. The Post Focus > Range Merging function then allows you to combine all or selected focus areas into one image using the same technology, again good news for macro photographers. The Panasonic S1R also has a time lapse function in which you can set the time interval and the number of images to take, plus a multi-exposure option that lets you combine up to four exposures in a single frame. The Panasonic S1R has one of the best, if not the best, electronic viewfinders that we've ever had the pleasure of using. The S1R's OLED unit has a phenomenal resolution of 5.76-million-dots, offers 100% field of view, a display time lag of 0.005sec, and a magnification ratio of 0.78x with a 50mm lens at infinity. The EVF operates at a native rate of 120fps with a minimum lag of less than 0.005 sec, just like the G9, which helps to make it completely flicker-free. Also located on the rear of the Panasonic S1R, from left to right, is a Lock button for locking some of the camera's controls, a Playback button, one-touch movie record button, conveniently located AF Area button which is surrounded by the AF Type switch, AF On button, and a thumb-controlled joystick that is as refined and nice to use as the one on the G9. It allows you to quickly and easily select the AF point without taking your eyes off the subject and is a very useful inclusion. Underneath is the Q button, which accesses the newly redesigned Quick Menu. The Q.Menu button provides quick access to most of the principal controls, including ISO speed, image size, image quality and white balance (by default there are 12 settings in total, depending upon the shooting mode selected). You can still access all of these options from the main menu system too. There are two different modes for setting the display style, and its also individually customisable for photos and videos. Underneath is an unmarked 4-way navigation pad system with circular scroll wheel and Menu/Set button in the centre. The four directions on the d-pad don't have a specific function, other than to move through and select options, playback images etc. The circular scroll wheel can also accomplish many of the same things. The main menu system on the S1R has been redesigned, making it even clearer and more straight-forward to use than the one on the G8. There are up to 7 main menus represented by a column of icons on the left of the screen, depending on which shooting mode you're currently using, which then show a subset of up to 8 different menus. 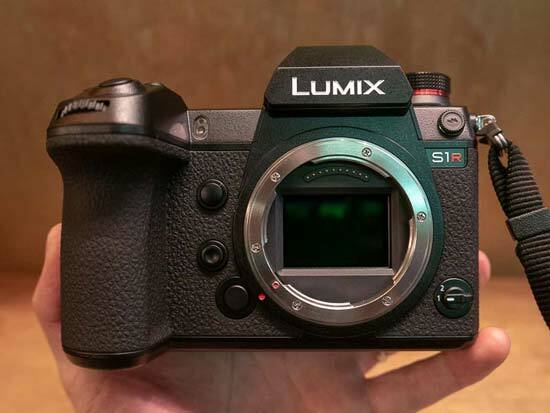 Completing the rear of the Lumix S1R are three more buttons, Back, Display and Delete. In the shooting mode, the Display button alternates between turning the display off, the main camera settings as icons, no settings at all, and an Info Display which shows the current key settings in a clear graphical format. On the bottom of the S1R is a metal tripod socket that's positioned in-line with the middle of the lens barrel and the battery compartment offering up to 340-shot battery life when using the Live Viewfinder. Thiscan be substantially boosted to 1,100 shots using the clever Power Save LVF mode. In real world use, we took around 300 stills and a few short videos and the remaining battery life was about 50%, so markedly better than the CIPA rating without having to use the power save mode. On the right side of the camera are the dual SDXC II and XQD memory card slots (compatibility with CFexpress memory cards is due to be added in the near future), and on the left is the Remote port for use with the optional remote shutter release, 3.5mm mic and headphone sockets, and two connection ports supporting the latest USB 3.0 standard for coth connecting the S1R to a computer and charging its battery, and a very welcome full-sized HDMI port.